SpaceX have announced the award of a reservation contract that lines them up as the launch service provider for three satellites that will make up the RADARSAT Constellation Mission (RCM). The agreement with MacDonald, Dettwiler and Associates Ltd. (MDA) calls for the satellites to ride uphill on a Falcon 9 in 2018. The announcement provides the first manifested mission for SpaceX’s 2018 commercial launch schedule. The launch reservation contract with MacDonald, Dettwiler and Associates Ltd. (MDA) will result in SpaceX supporting Canada’s largest space program to date. RCM is a three satellite configuration and will support Canada’s need for maritime surveillance, disaster management and ecosystem monitoring. 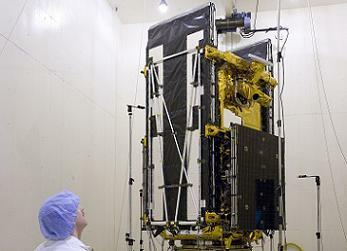 The mission will build on the successes of RADARSAT-1 and RADARSAT-2. RADARSAT-1 – launched on November 4, 1995 from Vandenberg AFB in California by a Delta II rocket – was Canada’s first commercial Earth observation satellite. It was expected to operate for five years, but surpassed its life expectancy by 12 years. RADARSAT-2 – a next-generation commercial synthetic aperture radar (SAR) satellite – was lofted into orbit in December, 2007 by a Soyuz 2.1b-FG launch vehicle with Fregat upper stage from the Baikonur Cosmodrome. RADARSAT-2 incorporated technical advancements that included a 3-meter high-resolution imaging, flexibility in selection of its scanning polarization, left and right-looking imaging options, superior data storage and more precise measurements of spacecraft position and attitude. The payload included the SAR antenna and associated sensor electronics required for imaging. EMS Canada – now MDA Montreal – was the SAR payload subcontractor. Operating in C-band, the RADARSAT-2 SAR payload ensured continuity of all the then-existing RADARSAT-1 modes, and offered an extensive range of additional features ranging from improvements in resolution to full flexibility in the selection of polarization options. The enhanced capabilities were provided by a significant improvement in instrument design, employing a state-of-the-art phased array antenna composed of an array of hundreds of miniature transmit-receive modules. Fully computer-controlled, the antenna provided the capability of being steered electronically over the full range of the swath and can switch between operating modes virtually instantaneously. 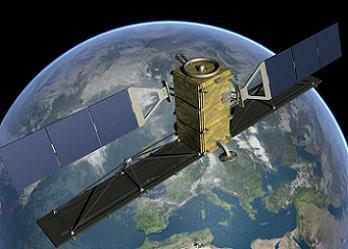 RADARSAT-2 was placed in a sun-synchronous orbit at an altitude of approximately 800 kilometers. The spacecraft is now midway through its fifth operational service year. The new RADARSAT Constellation Mission (RCM) consists of a three-spacecraft fleet – each smaller than RADARSAT-2 – providing new applications made possible through the constellation approach. 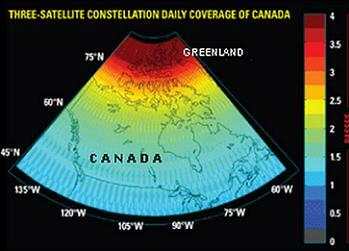 This approach results in more frequent area coverage of Canada and reduced risk of a service interruption – pending the end of RADARSAT-2’s service life – all while continuing to provide C band radar data that satellite’s users. While the baseline mission for this evolution in Canada’s Earth Observation capability revolves around three satellites, the constellation is designed to be scalable to six satellites. MDA – and their partner the Canadian Space Agency (CSA) – cite functionality could be added to a fourth satellite, with those functions – distributed across several satellites – made available to all constellation users. Utilizing SpaceX’s Falcon 9 v1.1, the agreement with MDA comes ahead of the debut flight of the upgraded rocket, which is coincidentally tasked with launching MDA’s very own “CAScade, Smallsat and IOnospheric Polar Explorer” (CASSIOPE) spacecraft in September. 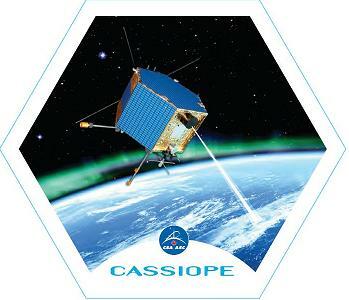 CASSIOPE – a made-in-Canada small satellite – is hexagonal in shape, measuring just 180 cm corner-to-corner and 125 cm high and weighing in at just over 500 kg. The new Falcon 9 is currently being integrated at SpaceX’s west coast launch site at Vandenberg Air Force Base in California, following the completion of acceptance testing at SpaceX’s Rocket Development and Test Facility in McGregor, Texas. (Images via MDA, CSA and SpaceX).